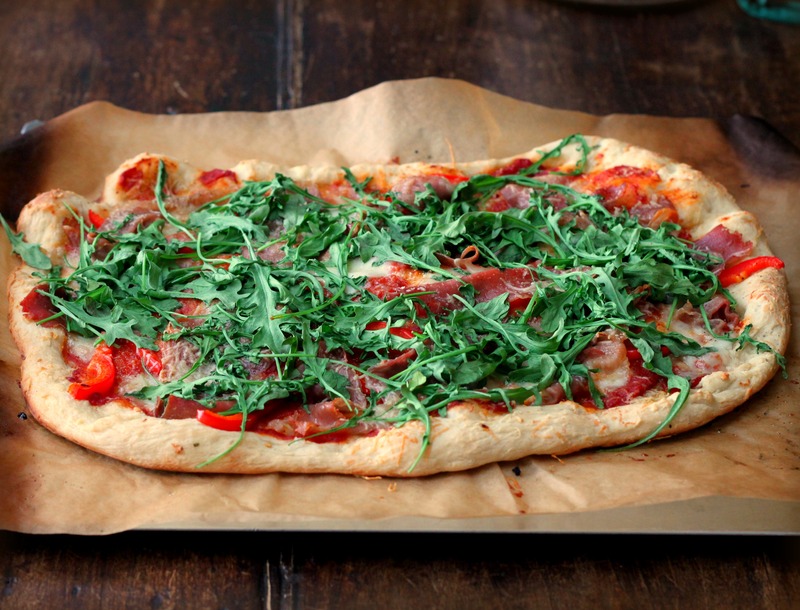 Homemade pizza is a popular dinner here at TasteFood – a family favorite that’s easy to make during the week with a simple list of fresh ingredients. The key is to have pizza dough on hand so you’re ready to go when the craving strikes. This may be accomplished by either making a large batch and freezing individual portions, or buying ready made dough at your favorite supermarket. During the summer, the pizza gets moved outdoors to the grill, keeping the heat away from the kitchen and adding great charred flavor to the crust. We keep our toppings simple and often pair salame or prosciutto with garden vegetables or heaps of fresh arugula. Add the arugula during the last minute or two of grilling so it just begins to wilt but retains its freshness. We call it a Salad Pizza. We like our pizzas white, which means with no tomato sauce. Instead, the dough is brushed with garlic oil before piling on the toppings. If you prefer red, then smear a thin layer of tomato sauce over the dough in place of the oil, leaving a 1-inch border. Brush the border with garlic oil. Makes 1 large rectangular pizza or 2 10-inch pizzas. Prepare the grill for direct cooking over high heat and preheat a pizza stone (or preheat oven and pizza stone to 500°F). Using your hands, stretch crust to desired shape. Combine 2 tablespoons olive oil and garlic clove in a small bowl. Lightly brush crust with oil. Arrange a layer of mozzarella over the pizza. Sprinkle with chili flakes. Top with a layer salami. Sprinkle Parmesan over the pizza. Brush the exposed edges with a little more olive oil. Slide the pizza onto the pizza stone. Close the grill lid and grill until crust begins to turn golden brown, 10 to 12 minutes. 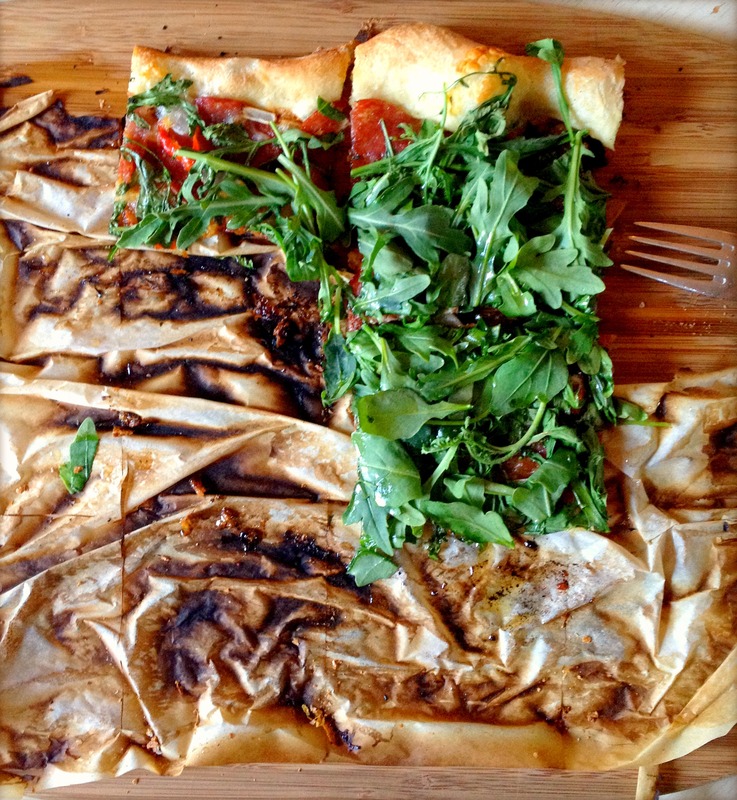 Drop handfuls of arugula over the pizza. Grill with the lid closed until arugula just begins to wilt, 1 to 2 more minutes. Transfer to a cutting board. Drizzle with olive oil. Cut in pieces and serve immediately. Adapted from a recipe by Alice Waters. Makes 2 – 10 inch pizza crusts. Stir yeast and lukewarm water together in a bowl. Add 1/4 cup all-purpose flour and semolina. Mix well. Let sit until bubbly, about 30 minutes. Combine remaining flour and salt in another bowl. Add to yeast with cold water and olive oil. Mix well to form a dough. Turn dough out onto a lightly floured board and knead with hands until dough is smooth and elastic, about 10 minutes. Or use a mixer with a dough hook, and knead about 5 minutes. Place dough in a lightly oiled bowl and turn to coat all sides with oil. Cover bowl loosely with plastic wrap. Let rise in a warm place until doubled in size, 1 to 2 hours. Punch dough down, and let rise another 45 minutes. Divide dough into 2 equal disks. Let rest 30 minutes before shaping. Lightly flour a work surface. Using your fingers or heels of your hands, stretch the disks out to 10-inch shapes. I love the idea of a salad pizza. This has all the ingredients I love in a salad so I can only imagine loving it in pizza form. I get lost in your eyes… Oh sorry. That pizza was so pretty I needed to serenade it! What an appealing summer dinner! Seasonal ingredients and pizza are made for each other! A beautiful and scrumptious looking pizza! A great choice of topping. You DO know how to make a wicked pizza, Lynda!